I remember it was kind of a big deal when the movie FORT WORTH played on TV when I was a kid, because it took place in, well, Fort Worth, 15 miles down the road from where I lived. Not that it was filmed there, of course, although the California locations don't look too unreasonable for the setting. I hadn't seen it in more than 50 years, so I decided it was time to watch it again. Anyway, in this one he plays a former gunfighter turned newspaper publisher who comes back to his hometown of Fort Worth with his partner just in time to get in the middle of a romantic triangle with his old buddy David Brian and the girl they both love, Phyllis Thaxter, as well as efforts to get the railroad to come to Fort Worth and a gang of cattle drivers who don't want the railroad to come in because it'll ruin their business. It makes for a movie that's a little on the talky side, but some nice action scenes crop up along the way. There's also a good supporting cast, with Ray Teal, Bob Steele, and Paul Picerni among the bad guys. The problem with this one is that the script by veteran screenwriter John Twist has numerous holes in it, and the direction by journeyman Edwin L. Marin keeps things pretty bland. (This was the last movie Marin directed.) Several scenes that could have been pretty good are set up but then nothing really happens. 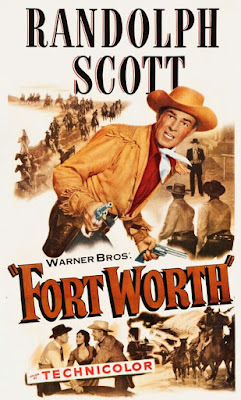 Despite that, FORT WORTH is a watchable Western because, well, Randolph Scott. He's perfectly cast as the noble, dignified, crusading newspaperman who can still buckle on his guns and be a tough hombre when he needs to. It's a minor entry in his career, but I enjoyed it anyway.